Thank you all for your kind words about Keanna's bucket of popcorn costume! So many have emailed, left comments and sent messages about it, and most were questions asking how I did it, how much it cost and how long it took. It really was simple to do and was so cheap too! I thought I'd post my supplies, directions and cost in case anyone wanted to try it next year. One afternoon at the beginning of October I asked the girls what they wanted to be for Halloween. It was raining and the girls were watching a movie and eating popcorn, so Keanna immediately said, "I want to be popcorn!" 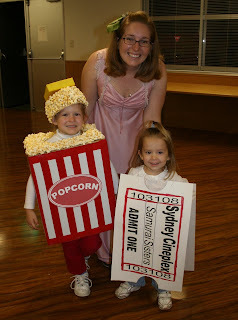 So I got online and Googled "Bucket of Popcorn Costume," and found a few pictures to give me an idea of what I needed to do; it also reassured me that this was possible! I was inspired by what someone else did, then put my own twist on it. I started with the box and cut holes for her arms and head. I made the opening for her head more of an oval shape so she had to turn her head to the side when getting the costume off and on. After that I started with the tape....alternated between red and white all the way around, and covered up the arm holes (on purpose) in the process. After the tape was on all sides, I poked a hole in each arm hole and tucked the tape inside. Then I put red tape along the top and bottom of each side to make it look neater and finish it off. I used a graphic design program to make the ovals and then typed "POPCORN" and centered it. I printed out two of those on cardstock, cut them out and hot glued one on each side. As you can probably tell, Keanna took all of the pictures, and I was working on the costume instead of folding laundry!!! And now it's time for the popcorn and glue gun! I popped three bags of popcorn and between the three of us we ate about half a bag. Kernal by kernal I glued them on and went two or three kernals high. After I had the popcorn glued all over the top of the box I hot glued the already spray painted turkey pot pie box to the top of the straw hat and did one layer of popcorn all around the hat. Sydney's costume was so simple! I bought a sheet of poster board and cut it in half. I printed out the words and numbers on clear sticker paper, cut them out and put them on the poster board. I used a red sharpie, cut the half circle out and used twine to attach the two pieces and put them over her shoulders. The hardest part was coming up with the name of the theatre and movie title, but I called my friend Susan in Hawaii and we brainstormed together. Mahalo Susan! See, told you it was easy! It took about four hours total and allowed for bonding time with the girls. OMG How adorable and Creative!!!! Thank you for posting instructions. I want to make a popcorn costume for my son this year and am going to follow your lead. Happy Halloween! Writer, cookier, wife and stay at home mom. The Navy has moved us (in the following order) to Annapolis, Maryland; Charleston, South Carolina; Balston Spa, New York; Groton, Connecticut; Kings Bay, Georgia; Pearl Harbor, Hawaii; back to Groton, Connecticut; back to Pearl Harbor, Hawaii; Yokosuka, Japan, Dam Neck, VA; back to Pearl Harbor; Newport, RI; Monterey, CA and now back to Japan. We'll see where else it takes us, but for now I'm just going with the flow. I enjoy every minute of it and am a sponge when moving to new places. "Mom, is it time for us to go to a new house?"